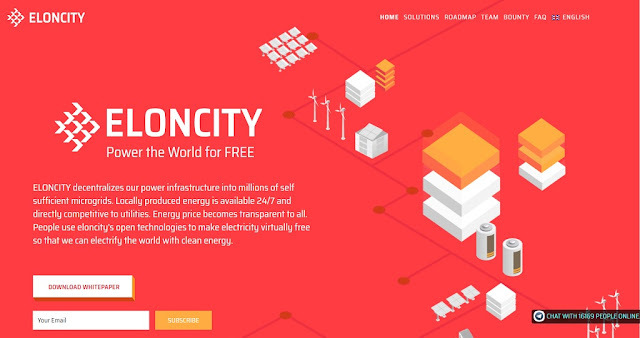 Eloncity is targeting the energy market with a blockchain solution. Climate change and the subsequent emergence of renewable energy sources have changed how energy is produced. Instead of big centralized nuclear and fossil energy production facilities, more and more smaller decentralized wind and solar energy plants come into appearance. At the same time many consumer of electricity start producing their own energy and turn from consumers into “prosumers”, producers and consumers of energy at the same time. "Eloncity decentralizes our power infrastructure into millions of self sufficient microgrids. Locally produced energy is available 24/7 and directly competitive to utilities. Energy price becomes transparent to all. People use eloncity's open technologies to make electricity virtually free so that we can electrify the world with clean energy." In this article, we will talk about the Eloncity token, ECT: What is ECT token? ECT token features and the use of ECT token in the future. 1) What is Eloncity Token #ECT? Supply: 1,000,000,000 ECT. Finite amount of ECT created. No inflation. 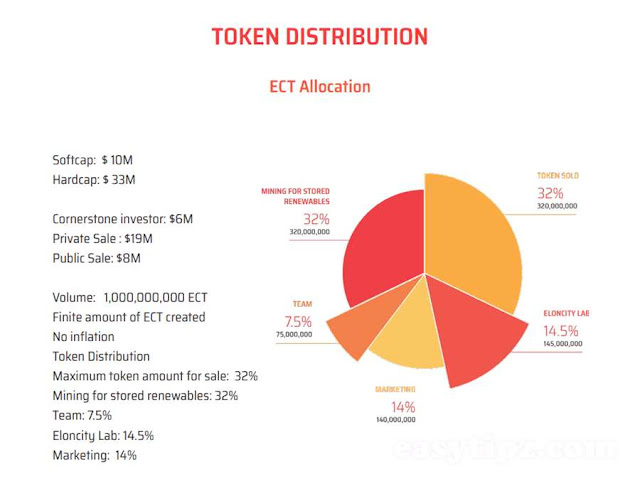 The Eloncity Token (ECT) is a utility token designed to enables energy exchange on an Eloncity micro-grid that is compatible with the Eloncity Token Protocol (ECTP). 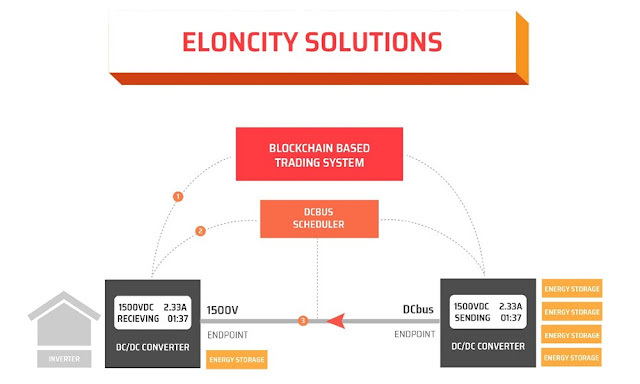 Supplying and consuming energy on the Eloncity network is paid in ECT tokens. Additionally, the token protocol requires each entity to store ECT tokens in equivalent to the value of its electricity capacity in order to participate in the energy exchange. This requirement decreases the transaction velocity of the ECT token and a serves as a stabilization mechanism for the token. Eventually Eloncity aims to make the ECT token the means of payment of an internationally unified renewable energy marketplace that connects various local communities with each other. - A store of value: Each ECTP-compliant BESS device needs to reserve sufficient ECTs that is equivalent to the value of its electricity capacity to participate in the automated exchange. That makes the ECT a store of value backed by the value of electricity. The value of each ECT is determined by the total energy transaction volume of the ecosystem, and the velocity of the ECT transactions. Due to the exchange reserve requirements, there is a limit for the monetary velocity, which creates value for the ECT and produces a stable token system. The total market capitalization of the ECT token will reflect the value of the electricity that is traded on the network. 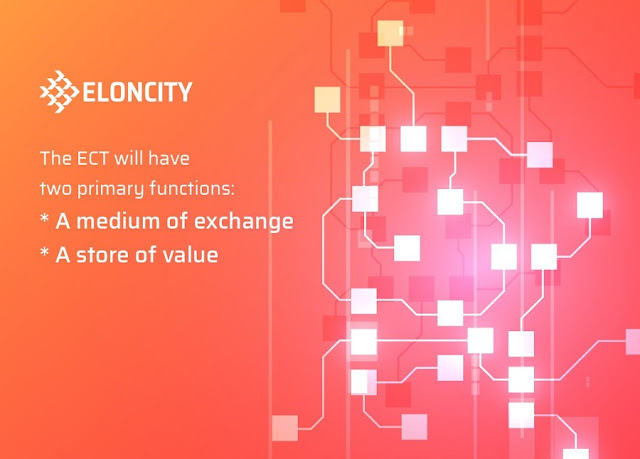 Eloncity Team estimates that the market capitalization of the ECT token could reach USD 5.6 trillion worldwide by 2040, and the exchange velocity of the token, which is estimated to be based on our market reserve design. That implies an eventual token market capitalization of USD 1.1 trillion. However, as future money is worth less than current money, we are discounting the 2040 market cap to present, assuming a prime interest rate of 3%, the resulting 2018 market capitalization of the ECT token is estimated to be USD 560 million. ECT token also performs several important functions besides being the medium for energy exchange in the community or store of values of renewable energy. The ECT’s most vital and valuable role is to be the unified exchange medium for linking energy consumers to renewable energy solution providers in the emerging decentralized shared economy. The communities and villages can use their ECTs to access renewable energy product choices and service options. This process of connecting solution providers to the energy consumer would create a unified renewable energy marketplace that is not limited by geographical separation, political boundaries, economic barriers, or any real or artificial barricades. As this marketplace grows organically from one local community into a unified global marketplace, the values of the ECT will increase significantly. We all know that ECT token is one of the key feature in the Eloncity platform (Eloncity eco-system). This ECT token is a utility token, designed to continue the process the exchange of power/energy in the platform or this ecosystem. ECT token works inside the Eloncity platform. - Blockchain-based AI trade system: By combining AI-algorithm and blockchain technology, Eloncity with help of the token hopes to establish a transparent and fair energy market with real-time prices as reference. - Smart Energy Storage Systems: The Energy storage system will work with the IoT technologies to help balancing the demand and supply of the produced renewable energy. - Switching DC Power Bus: With the energy production and distribution, there is need to control the energy peaks, and the Switching DC Power helps remove typical peak load permanently. - Direct Current appliances: Eloncity with help of the token will accommodate the use of DC-driven devices to eliminate the use of repetitive power conversion and enhance the competitiveness of the produced renewable energy. - Proof of Stored Power (PoSp): Eloncity will incorporate a Proof of Stored Power protocol, which is a new mining scheme to make ESS investment grade financial entities. - To create an open global marketplace that enables communities around the world to access advanced renewable energy products and services with ECT token. Due to the exchange reserve requirements, there is a limit for the monetary Eloncity, which creates value for the ECT token and produces a stable token system. 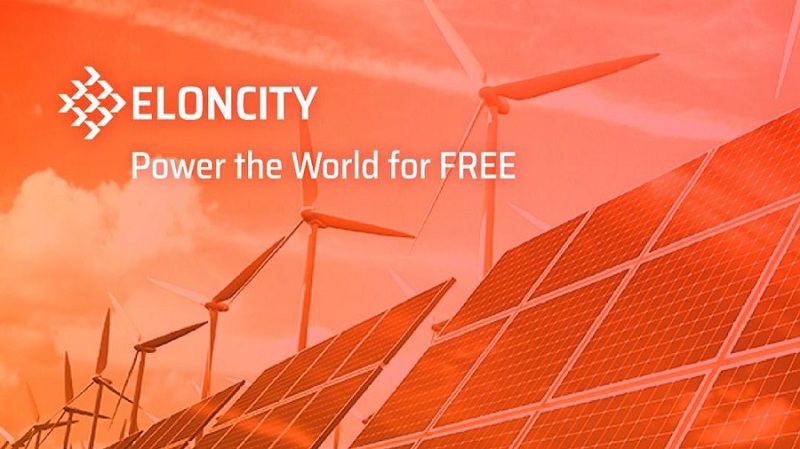 Eloncity with the use of ECT token will help communities as well as the individuals and companies within them to invest in energy efficient facilities and equipment that will save them energy cost and also help the generation of renewable energy for their use. Eloncity with the help of ECT token will bring a better solution by powering facilities indefinitely with locally generated energy from renewable resources. It will be a welcome strategy to replace fossil fuel energy resources and to eliminate the dangers that is associated with them. At some point in the future, building-to-building energy exchange will likely be reduced significantly as high capacity BESS become more prevalent due to the low-cost of battery cells. Future buildings are expected to be increasingly energy self-sufficient. The question at that point would be whether the exchange volume of ECT will still be high or not. The Foundation’s analysis suggests that the energy exchange due to electric vehicle (EV) charging from inter-microgrid roaming would grow significantly, and thus offset for any reduction in buildingto-building energy exchange volumes. As discussed in more detailed in the Eloncity Whitepaper, the EVs and roads will become another network for distributing renewable energy. The ECT is expected to continue playing the crucial role as the medium for energy exchange in that future. Eloncity is the 5th project that introduced by Krypital Group - a leading consulting firm that provides professional and comprehensive blockchain marketing services. The firm has become very famous and legit since promoting all the succeed ICO projects, includes CyberMiles, ArcBlock, Merculet, Egretia. To sum it up, Eloncity tries to build a community power facility by using the “decentralized new energy community power supply + energy storage equipment”, and gradually complete the group grid connection of the smart grid micro community in order to establish a decentralized community electricity exchange market. Eloncity's goal is not to replace centralized power generation. Instead, it hopes to reduce residents’ dependence on a centralized power supply system and improve overall resource utilization. Eloncity team will join the 2018 World Tour blockchain workshop - "Making The Impossible Possible"
The Public Sale event of Eloncity was planned to start for contribution in September 2018 via Tokeneed ICO platform. If you do not have an account at Tokeneed yet, sign up via this link to get 3% addition bonus.